So I will admit that I’m not eating or making these at 35,000 feet. That would be really cool though right? 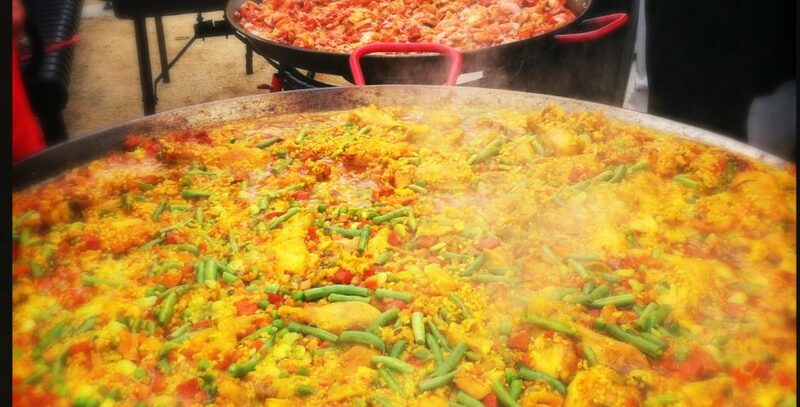 I am, however wishing I could have an inflight meal of these right now. I’m on my way back from a whirlwind trip to the east coast for the paying job and am only now finding time to write about this delicious recipe find.
) food photography/blogging meeting and I jumped at the chance! I got some great pointers and friended a few new people in the food industry after the meeting. One in particular posts a lot of good recipe links, and this one caught my eye. The recipe I had called for chicken legs on it, but I prefer thighs. Mmmm, thighs! So much tastier and meatier, especially more so than breasts. Those are just…well, blah and dry. And bone in thighs too. I was baking these puppies and I wanted that extra flavor from the bone. On a sheet tray lined with parchment paper, and into the oven they went to bake as I got to making the sauce. I think I might play around with the sauce next time I make this. It was a little too runny and I wanted more of it to stay on the chicken when I poured it over them the last 10 minutes too cook. I might try using agave syrup, or less lemon juice. Regardless, the lemon curry chicken came out delicious! The sauce on it was tangy and sweet, with the exotic notes of curry in the background and not being overwhelming like – “HI YOU ARE EATING CURRY AND WILL SWEAT SPICE OUT FOR THE NEXT 3 DAYS AND ANNOY YOUR YOGA BUDDIES ON THE MAT NEXT TO YOU IN HOT YOGA!” kind of curry. 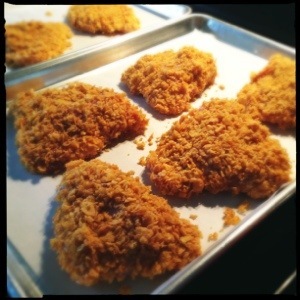 And the cornflake crust got nice and crunchy without burning, while the thighs were tender and most. With a little tweaking to be done, this is a must repeat recipe for sure!! Now if I could just get a decent meal on this flight… Oh flight attendant!!! Bread the chicken pieces, first in flour, then in egg and last in the crushed cornflakes and put in oven to bake at about 350 for 30-40 minutes. Then make the sauce. 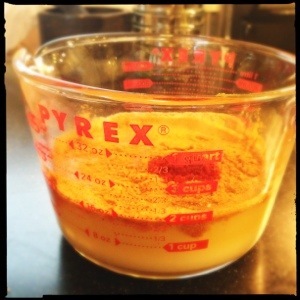 Mix all the sauce ingredients in a measuring cup and heat in the microwave just for about 20 seconds so that it warms up and the sugar dissolves. Reserve to pour over the chicken when it’s baked. 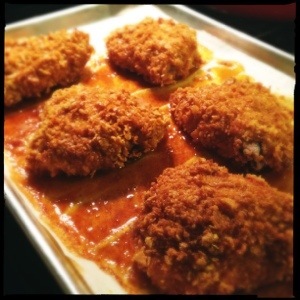 When the chicken is just about done, pour the curry sauce over the chicken and bake for about another 10 minutes. Watch so the sugar in the sauce will burn if you bake it too long. Bake it just long enough for the sauce to reduce a bit and get all sticky and gooey. In a large skillet or frying pan, sautee onions and garlic in olive oil until soft, about 3-5 minutes. 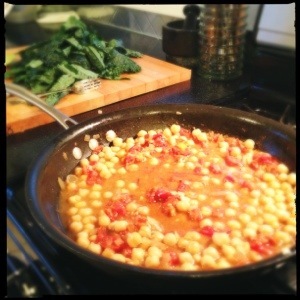 Add chickpeas straight from the can, including all the water. Add spices and lemon juice, cover, and simmer about 10-15 minutes, stirring occasionally, adding more water if needed, until chickpeas are cooked and soft. Reduce heat, add kale and cover. Allow kale to wilt for 2-4 minutes. 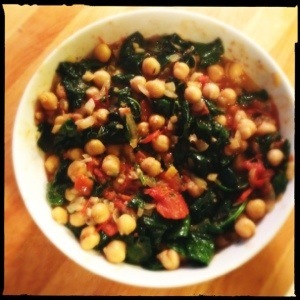 Serve immediately and enjoy your chana masala! 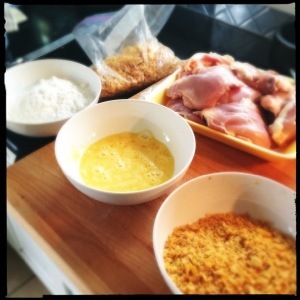 This entry was posted in Dinners and tagged chicken thighs, cornflakes, Curry. Bookmark the permalink. The chicken looks really good, but the Chana masala…Wow! I’m definitely adding that into the meal rotation for next week!